Unfortunately there is no standard sizing in Australia. This can make it difficult to know what your size is when ordering uniforms from different brands. In addition, different brands use different sizing methods, either “Half Chest” which measures the garment, or “To Fit Chest” which measures the wearer. If the garment measurements say “Half Chest/Bust” then choose a similar garment from your wardrobe that you are comfortable wearing. Lay it down on a flat surface and measure it from left to right across the chest, about 2cm below the arms. This is the half chest measurement of the garment. Then using the sizing information for the garment you want to order, choose the size with the closest half chest measurement to your own garment. If the garment measurements say “To Fit Chest/Bust”, then measure around the fullest part of your chest/bust under the arms with your arms in a resting position. Then using the sizing information for the garment you want to order, choose the size with the closest chest measurement to yourself. 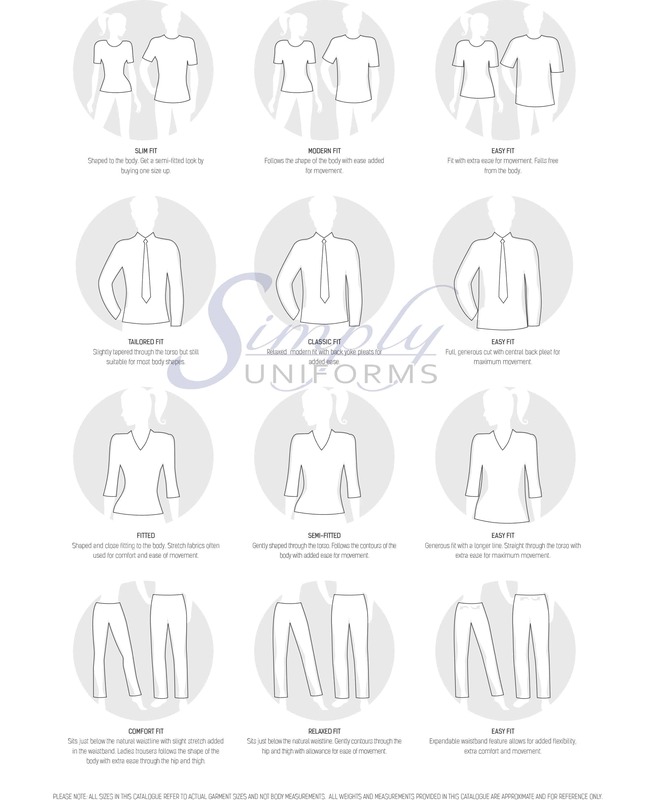 As each garment has a different sizing, feel free to contact us and request a sizing guide. We’ll send you back the specific sizing guide for that garment. Please bear in mind that all garments are stitched together by hand, so the sizes given are approximate and can vary by 1-2 cm. It is always better to choose a size too large than a size too small. We don’t normally accept returns of uniforms where the incorrect size has been ordered, so please check carefully and contact us if you have any questions. We'll happily send you the specific sizing guide for the garment(s) you interested in ordering for your company. Just complete our contact form requesting a sizing guide listing the garments you require the size guides for. There are a number of different fits available. The chart below shows the fit name and how it will fit when worn. Don't worry if you're unsure about sizing or fitting, just drop us a message with your question and we'll help you out.